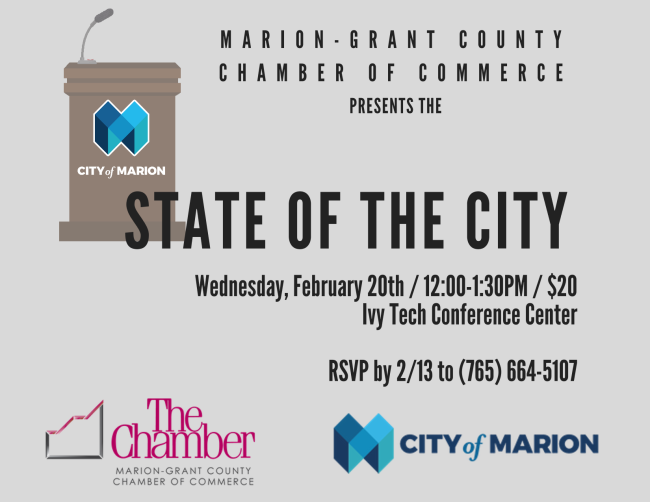 Reg­is­ter now for the 2019 State of the City Address. It will be held at the Ivy Tech Con­fer­ence Cen­ter on Wednes­day, Feb­ru­ary 20th, from Noon to 1:30pm, pre­sent­ed by the Mar­i­on-Grant Coun­ty Cham­ber of Commerce. Don’t for­get to reg­is­ter by call­ing 765.664.5107 by Feb­ru­ary 13th. We’re ready to see you on Feb­ru­ary 20th!